Theft is nothing new, and in today’s economy, it seems that more and more people are taking advantage of the opportunity. Although retailers have worked hard to anticipate what products shoplifters might pursue, some of the newest items being targeted might surprise even the most seasoned loss prevention professionals. Topping the list of shoplifters’ most desired items are teeth-whitening strips. Throughout the United States, retailers have experienced an uptick in the theft of these high-dollar items. One spokesperson for a major drug retailer names them as one of the top shoplifting targets in the retail industry at large. With nearly every retailer in the grocery, discount and drug vertical markets stocking these strips in multiple facings per store, the problem is widespread. What makes the strips so appealing to thieves? In a few words, resale value. Based on police reports, shoplifters want to make money quickly and are selling the stolen strips on the street for a fraction of the cost. 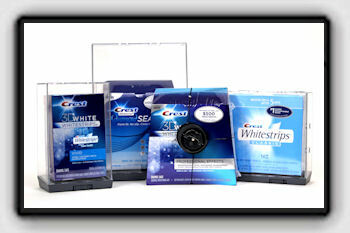 With name brand products like Crest Whitestrips averaging between $44 and $55 per package, it’s not surprising. Instead of resorting to locked cabinets and other defensive merchandising techniques that reduce sales, retailers can take advantage of Alpha solutions and display their high-risk whitening merchandise openly and with confidence. Alpha offers a variety of solutions tailored to protecting teeth-whitening merchandise. In addition to our signature Spider Wrap®, Alpha also has a selection of Keeper® sizes that effectively protect high-end dental products. These products range from 1 Alarm to 3 Alarm® technology to offer increased levels of merchandise protection. Visit www.alphaworld.com to check out all of our options. "Market popularity, brand recognition, and price point have made whitestrips desirable as a high-theft item," said Hans Ohren, Alpha Product Manager. "And as long as shoplifters continue to target unprotected merchandise, Alpha will continue to provide solutions to protect these strips on the shelves and out of the hands of thieves."